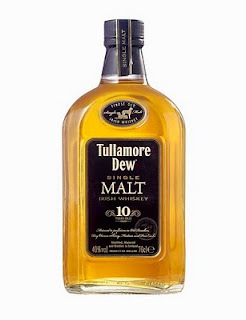 Here's a new whiskey to get excited about: Tullamore Dew 10yo single malt. I haven't sampled it yet (it should be out before the end of the year) but I have high expectations. That's because I am already familiar with the various component whiskeys that will go into this and they are some of my favourites. This was a bold venture because all modern Tullamore Dew is made by Irish Distillers at its Midleton plant. It's a blend of grain whiskey and triple-distilled pure pot still. The new whiskey, in contrast, would be made by Cooley and it would be a double-distilled single malt. In other words, it would share nothing in character with the rest of the Tullamore Dew range. In the end, C&C backed out of the project. It had given Cooley an idea though and they released the 10yo finishes under the Tyrconnell label as 46% ABV single cask bottlings. Delicious they are too and very well-regarded by the critics. C&C have had a somewhat confused strategy over the last few years. Although their spirits division posted consistent returns, they concentrated on a risky cider gamble that ultimately failed (though they have pulled this back somewhat with a very nice pear version recently). They have never appeared entirely sure what to do with Tullamore Dew. It's the second biggest brand in Irish whiskey (after Jameson) thanks to strong sales internationally and could certainly cope with some brand extension. Having decided to abandon the 10yo single malt, they released a new 10yo blend made in Midleton, as usual. Now they have reignited the deal with Cooley and will bring out the 10yo single malt after all. This new whiskey will be a vatting of the three finishes - sherry, madeira and port - along with some unfinished malt. It will be bottled at 40%. The price in the US, according to John Hansell's information, will be $40. That's in the same ballpark as Black Bush so I'm going to guess at around €35 here in Ireland (update: wildly optimistic - see comments). That would be very good value if it's as good as I hope.